Both had stood on the Fenway Park mound for the biggest of moments. Both had shown postseason genius, helping lead the Red Sox to a curse-breaking championship and a greatness-solidifying championship. That was why, as he walked from the visitors’ bullpen to the dugout at the start of last night’s game, and as he walked off the mound and tipped his cap with his day done in the seventh inning, Derek Lowe received standing ovations from the crowd of 38,029, receiving almost as much adoration as the Sox starter, Josh Beckett. 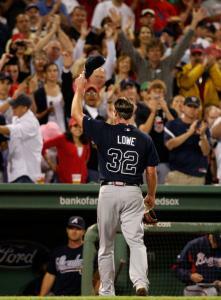 While Lowe was good, he was no match for the Sox’ No. 1. Bouncing back from a game that got away last weekend in Philadelphia, Beckett personified brilliance. From his demeanor to his breaking ball to his overwhelming (and perfectly placed) fastball, Beckett was awesome in every sense, needing just 94 pitches and 2 hours 11 minutes to take out the Braves, 3-0. Beckett took this one on himself, allowing just five hits, all singles, notching 11 straight outs from the fourth to the start of the eighth. No Brave reached second base until the eighth, and that rally fizzled with a double play. Beckett didn’t need much help from a recently lackluster Sox offense. The first run, in the fifth, was all he needed. Although Hideki Okajima warmed in the eighth, when Beckett allowed two singles, and Jonathan Papelbon got ready in the ninth, the services of neither were required. Beckett’s most important pitch was to Jeff Francoeur, which the outfielder slammed back to the mound. Had Beckett not nabbed the ball, it was unlikely the Sox would have gotten two. But he did, and in starting a double play he whipped perhaps his hardest throw of the evening at shortstop Nick Green. From the start, it was clear the pitchers would rule this one. Between the 97-mile-per-hour fastball that vanquished Yunel Escobar to the infield single awarded to Chipper Jones that had the feel of an early no-hit spoiler, Beckett was dealing in the first. And Lowe wasn’t far behind, opening with three ground outs. Sure, there were base runners, just not many. And his location was spot on. Although Lowe’s fastball might not be in the rarefied air of Beckett’s, his sinker was no less effective than Beckett’s four-seamer. He allowed his first hit - a double to former teammate David Ortiz - in the second. Six straight outs followed, until Kevin Youkilis drew a walk with one out in the fourth. Lowe was the first to break. A two-out double by his old backstop, Varitek, evaded center fielder Nate McLouth in the fifth. A wild pitch sent Varitek to third, and Green followed with a double to center to drive in the game’s first run. Beckett got more support in the sixth on J.D. Drew’s double off the Wall and Youkilis’s single. The Sox tacked on a third run in the seventh on Varitek’s second double, a single by Green, and a fielder’s choice. That was all Beckett needed. And, after 94 pitches, it was all over. Tight, efficient, a joy to watch for those on the field, in the stands, and in the dugout.